Hitachi products once looked staid in appearance; but like the jungle beasts they seem to emulate, the current Hitachi machines look impressive and generally are in use, too. 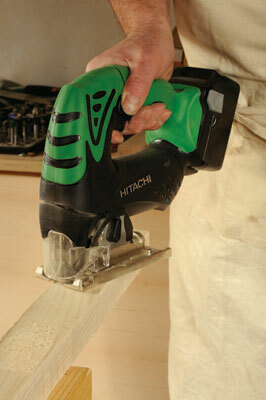 The CJ 18DSL is an 18V cordless Li-ion jigsaw that is similar in capability to a mains version. 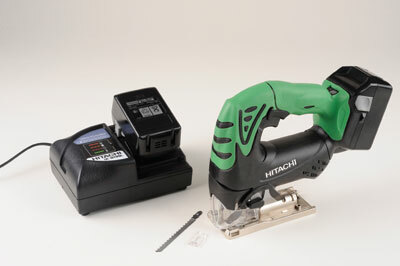 Hitachi also have a 14V version and two mains powered models in their UK range. First, plug a battery into the charger. The fan is very noisy during charging, although on a busy building site it matters less. The jigsaw body has plenty of rubber overmould for comfort, and a smoothly sculpted profile. The trigger switch is locked by a very positive side push button and released by pressing it the other way. A button and lights above the battery fitting show the charge. The motor and gearbox are quite noisy, in a reassuring way. Blades are fitted with the now ubiquitous pull out lever which opens the blade clamp that springs shut when the lever is released. The standard blade is a viciously sharp 90mm up-cut blade. The baseplate appears to be a machined aluminium casting with nickel plating to give a smooth sliding action and prevent surface marking for which bare aluminium is notorious. An Allen key, stowed on the base by a rubber bush, is used for adjusting the baseplate for bevel cutting. The plastic guard must be removed to swivel the base, leaving the waggly wire guard for safety. An anti-spelch insert is supplied and there are three cut-orbit settings for varying thickness and for curved or straight cuts. The charger is noisy but quick. It is not the slickest jigsaw Iâ€™ve tested, but it cuts well in softwood and manufactured board which most jigsaw work consists of. 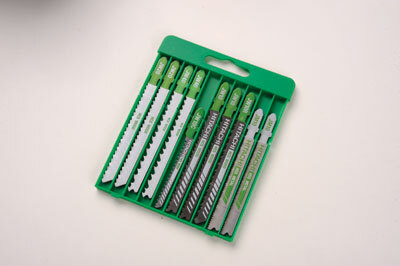 Hitachi supply various high quality blades for different uses. It lacks extraction or a blower, but they rarely work so I didnâ€™t miss that. A good site tool, helped by a lack of mains lead which is a particular pain with a jigsaw, especially when you need portability and unfettered curve cutting.